Fitness Keeper It’s our 8th birthday! 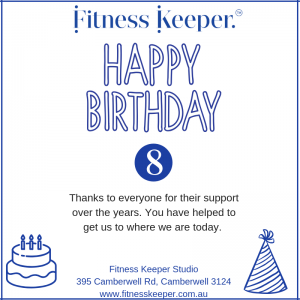 Fitness Keeper has turned 8 years old! We’d like to thank every single person who has had any involvement with us over the year s. Thank you to our current team, to previous trainers and team members, our wonderful clients both now and along the way, and they shouldn’t be listed last but a huge thank you also to family and friends! You have all helped us in some way and we’re very grateful and thankful to be able to continue doing what we love. To celebrate turning 8, we have 8 special offers which we will release one at a time. Stay tuned!